Sierra is a dedicated and experienced full-time nanny who has cared for children from infancy through 15 years old. Her capable and assertive personality is a positive, adaptable fit for the busy, on-the-go family with changing needs. Sierra is intuitive and nurturing. She is responsible, reliable and trustworthy. Working with children is an opportunity for personal growth and the chance to enrich their lives. 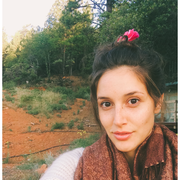 Sierra is passionate about birth work and holistic wellness. She is a trained Douala and an aspiring midwife. She loves cooking, doing yoga, playing outside and sewing. She enjoys working with kids, encouraging them and teaching them. She believes we can improve the world by educating young women and children. Sierra also believes in positive, gentle parenting. She has a way of creating a fun-loving, learning environment for children to thrive in.